The biggest change for 2012 is to the Trail Teams Special Edition, which sheds its army-olive paintwork for a new and exclusive shade called Radiant Red. Bumpers, grille, and door handles are still blacked out, and the package has been expanded to include even more off-road equipment. 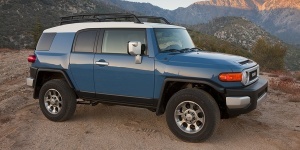 Find the used Toyota FJ Cruiser of your choice from a dealer in your area. Search our used car listings now.